Congratulations to "Tammy Y", the winner in Janie's giveaway. Thank you to all who participated! It’s my first time here on Just Romantic Suspense and I’m so excited! I’m a new author – 2014 was my first time being published and it has been a thrill! My debut novel PRIMAL INSTINCT was a Top Pick by RT (Romantic Times) Magazine in April. My new 4-book OMEGA SECTOR series for Intrigue begins this month. The books are based around the Branson siblings – three brothers and a sister – who find their lives and hearts in peril. They are all connected to Omega Sector: a covert, interagency task force, made up of the most elite agents our country has to offer. Book 1 INFILTRATION is available now, the novel critics have called “insanely intense” with “passion that leaps right off the pages.” (RT Magazine, January 2015). 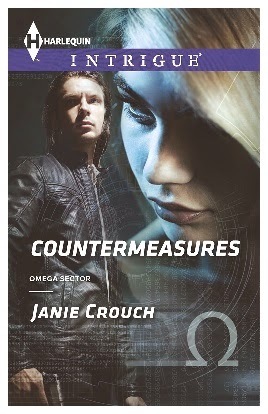 Book 2 COUNTERMEASURES will be available in January. Omega Sector agent Cameron Branson is on the most important case of his career – recovery of highly-classified code-breaking software that has fallen into the worst possible hands. After months of undercover work, he’s on the verge of recovering the software and finally putting to rest the demons that haunt him. Until graphic artist Sophia Reardon – a familiar face from his past – happens to show up in the wrong place at the wrong time. Knowing that with a word she could expose him, Cameron is forced to hurl this innocent beauty into his world of deception and terror. And as it all begins to unravel, Cameron must choose – finish the mission that could protect so many or save the one woman he’s never been able to forget. Cameron knew he had to think fast. A single word from Sophia, any sort of gesture that she knew him, would mean both their lives. In a split second, Cameron made a decision. But he knew it wasn’t going to be pretty. Cameron pushed Sophia, probably a little rougher than necessary, face-first up against the warehouse wall. He heard her indrawn breath, but steeled himself against any thought of her pain or fear. It was going to get much worse. Cameron kept his hand pressed against Sophia’s back, keeping her forced against the wall. Behind him he heard Fin and the other guys draw their weapons. He willed Sophia to keep quiet. “Did you check to see if she was wearing a wire or anything?” Cameron demanded. Marco looked sheepish and shook his head. Cameron made a big show of running his hands all over Sophia’s body, as if looking for surveillance equipment. Behind him the guys made a couple of catcalls. Sophia shuddered. When his body search led to her hands, he could feel Sophia press some sort of card into his palm—he wasn’t sure what. He moved so he more clearly blocked her from Fin and the men’s view, and palmed whatever she had given him without looking at it. As he turned, he slipped it into the pocket of his jeans. “She’s clean,” Cameron said as he spun her around. Sophia attempted to straighten the clothes Cameron had lifted and moved during his search, her face burning. Oh, God. He pulled the slap as much as he could without making it obvious, but he knew it still had to hurt. Her head flew to the side. He watched as a bit of blood began to ooze from a split in her lip. Cameron thought he might vomit. But if she had said his name, they would both be dead, or at the very least his undercover work would be blown. He couldn’t take the chance. Cameron prayed like he had never prayed before that Sophia would keep quiet. He felt a bit of relief when she nodded slowly, staring at the ground. “Whoa, Cam. I didn’t think you had that in you.” Fin chuckled. 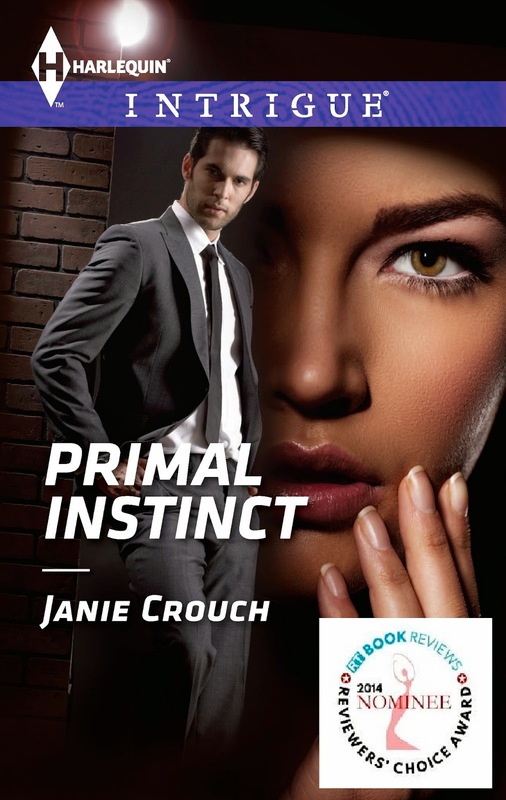 Janie Crouch’s debut novel PRIMAL INSTINCT has been nominated for a 2014 RT (Romantic Times) Reviewer’s Choice Award for best Harlequin Intrigue. Janie lives with her hubby and four kids in Virginia, but will soon be relocating to Germany for a few years. She loves travelling, adventure racing, and movies of all kinds. 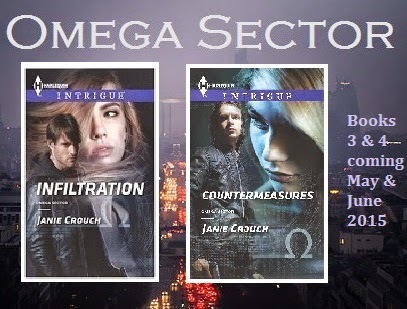 Janie is giving away a set of the first two Omega Sector books INFILTRATION and COUNTERMEASURES (U.S. readers – print or ebook; International readers – ebook only). Leave a comment for a chance to win: What is your favorite action movie? Giveaway ends 11:59pm EST December 17th. Please supply your email in the post. You may use spaces or full text for security. (ex. jsmith at gmail dot com) If you do not wish to supply your email, or have trouble posting, please email maureen@justromanticsuspense.com with a subject title of JRS GIVEAWAY to be entered in the current giveaway. Any of the X-Men movies...love them! Me too! Although the Avengers are probably my favorite. I've read INFILTRATION and loved it. Intense, dangerous, and satisfying....it hooked me from page one. Can't wait for the next one! My favorite action movie right now is "Battleship". A fav action movie of mine... definitely Die Hard... thanks for sharing with us today Janie! Thanks, Tammy. I thought Keanu Reeves was at his best in that movie. Looked so good! Can't beat straight up Bond! Classy! Haven't seen that one in a while. Congrats to Janie on the new release! I'd have to say that one of my favorite action movies will always be Speed :) Thanks for sharing! Right now my favorite is SKYFALL - a fun & revealing James Bond movie. I like Skyfall too. A little less intense than the previous couple before that. My absolute favorite! Can't wait for the sequel. Looks fantastic. Has to be a fantastic read. Can't wait to get to it !